Keep your current desk, just convert it with the E3 Compact Stand Up Desk Converter. Boasting all of the features you'd want in a sit-stand converter, just simplified to the extreme, you'll have a more ergonomic workspace in no time thanks to one desk topping addition. Adjusting this ergo-friendly standing device is more than easy. Just slide a tab to unlock it, grasp and raise the worksurface, and lock it in place where you're most comfortable. The E3 fits on spaces at least 28 inches wide by 14 inches deep, and allows you to work in more comfort and in a space that's better for your body. Enjoy more freedom to adjust with the E3 Compact Stand Up Desk Converter by UPLIFT Desk. If your current workstation is something you can't part with but you crave better ergonomics, the E3 Compact Stand Up Desk Converter by UPLIFT Desk can help. It comes fully assembled and ready to use, just set it on workspaces at least 28 inches by 14 inches, and get to adjusting to your preferred heights! What is the E3's weight capacity? The E3 Compact Stand Up Desk Converter comes with a lifting capacity of 11 pounds. Our E3 Compact Stand Up Desk Converter by UPLIFT Desk comes in your choice of black or white to match your workstation and decor. How does it work? Is there a motor in the converter? The E3 Compact Stand Up Desk Converter works by way of a built-in gas cylinder. This means the converter doesn't need to be set up by an outlet to work. Is this the only desk converter available for sale? No. If the E3 isn't what you're looking for, we have a desk converter model for everybody and every workstation. Check out our full selection of Standing Desk Converters by UPLIFT Desk and let us help you find the right desk converter for you, whether it's the E3, the Adapt X, or the UPLIFT Riser or Clamp Desk Converters. The E3 Compact Stand Up Desk Converter is simple to assemble, because there is no assembly! Simply set on your workspace, slide the tab to unlock it, adjust to your most comfortable standing heights, and lock it in place. 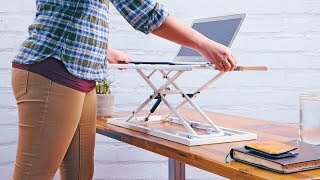 What's the best part about the E3 Compact Stand Up Desk Converter? We love the E3 because it's one of the sleekest and most affordable desktop converters on the market today. The platform saves you space and folds down to less than an inch, so it fits in a variety of work environments. When you need a sit-stand solution now, the E3 is an ideal converter to help you get the ergo-friendly working postures you need to stay comfortable at work. Choose between black or white for your E3 Compact Stand Up Desk Converter by UPLIFT Desk. This ultra-thin desktop converter will provide a functional workspace when closed, and easily lifts up to convert your desktop into a standing workstation. $129.00 List Price: $169.00* The list price is the same as the MSRP (Manufacturer's Suggested Retail Price). It may not necessarily be the price at which the product is sold.